One of our favorite quick breads for this time of year is Zucchini Bread made with fresh zucchini. My Mom has made this recipe for many years. I decided to change it up just a bit and add chocolate chips for Zucchini Chocolate Chip Bread. It’s SO yummy!! Mix flour, salt, baking soda, sugar, cinnamon, cloves, nuts and chocolate chips together in a large bowl. In a separate bowl, mix zucchini, water, vanilla eggs and oil or butter. Add wet ingredients to dry ingredients and mix well. Divide batter between two greased loaf pans and bake for 1 hour to 1 hour 10 minutes or until a toothpick comes out clean. Cool in pans for 10 minutes before removing to a cooling rack. 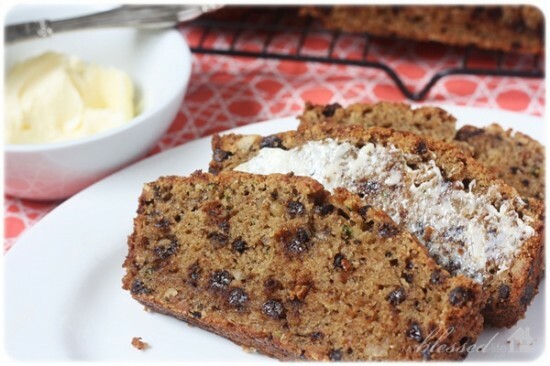 Have you ever made Zucchini Bread before? I’m linking up to Tasty Tuesday, Women Living Well, I’m Lovin’ It and Weekend Wrap Up Party! 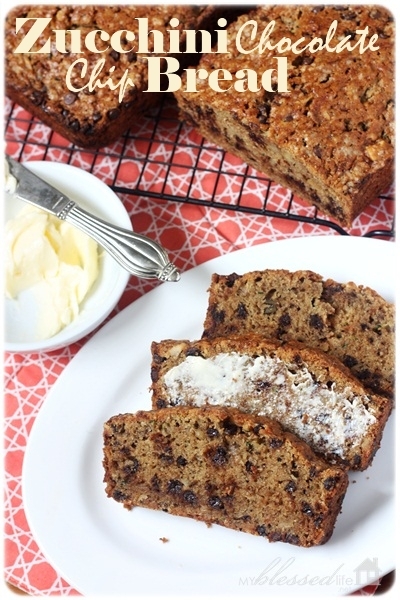 I haven’t made zucchini bread in years…but now I’m inspired to make it again! 🙂 Think I’ll use whole wheat flour. I make zucchini bread several times a year and we love it. I’ve never tried coconut oil instead of butter but I’ll be trying your recipe this week as we just got our farm box with several delicious zucchinis inside. Thanks, Myra! Hey..Its looking too yummy and delicious. I’ll try it. Looks so yummy! Zucchini bread is one of those recipes that I’ve never tried but always wanted to. This makes me want to try it now:) Thanks for sharing! I love zucchini bread and used to make a lot of it. Love the chocolate chips. I hope you don’t mind me PINNING this!!! yumminess!!! THANK YOU! Mmm your zucchini bread looks delicious!!! Love the addition of the chocolate chips, I’ll have to do that next time! Chocolate chips make everything better!!! I’d like to make this but I don’t use white flour, so hopefully coconut or almond flour will work. Has anyone else tried this recipe with a healthier flour? Love zucchini bread!! To have it all year, grate your fresh zucchini and freeze in small bags!!! I have also used blueberries instead of chocolate chips !! !